In order to attend medical school, one must work hard, be determined, and in many cases, borrow student loans to compensate for the high costs associated with earning a medical degree. As the cost of tuition can range from $10,000 to $25,000 each year, many medical students are forced to take out both federal loans and private loans in order to fund their schooling. While having student loans might not have seemed like much of a burden during medical school (when payments were not required), the debt that you accrued can definitely have an impact on you after graduation when you enter into repayment, especially when you are just beginning your career. If loan debt is a problem for you, don't worry, you are not alone. According to the American Medical Association, in 2006, 86.6 percent of graduating medical students carried outstanding loans, with the average loan debt totaling $130,571! That said, if you choose to look on the bright side, as far as debt goes, student loan debt is a positive kind to have. Students take out these loans to further their educations and to better themselves. The trouble with student loans, however, especially multiple student loans with different lenders, is that besides being costly, it can be stressful and time-consuming to make multiple payments to multiple lenders each month. But, the good news is that there is a solution that helps alleviate the burden of student loan debt. That solution lies in consolidation. Consolidation bundles all of your outstanding student loans together in to one easy-to-manage loan. As a result, you only have to make one low monthly payment to a single lender. Consolidation not only cuts out the unnecessary stress of having to remember to make several monthly payments to several different lenders, but it also saves you money! When you consolidate your private student loans with Medical School Loans, you can save thousands of dollars over the life of your loan! Extended Repayment Terms of up to 30 Years! Read on for more details about each of these great benefits that Medical School Loans offers with our private student loan consolidations! A Medical School Loans Consolidation offers competitively low, variable interest rates and low origination fees to help you save as much as possible. In order to determine your low interest rate, Medical School Loans uses your credit standing, ranking your credit status on what is called a credit tier. The better your credit standing, the higher your ranking on the credit tier. Your ranking on the credit tier helps to determine your interest rate. The higher your ranking on the credit tier, the lower your interest rate on your private loan consolidation. The interest rate for your private student consolidation loan is also based on the three-month London Interbank Offered Rate (LIBOR) rate, as well as the highest level of education that you, the borrower, have achieved. The LIBOR rate varies on a quarterly basis based on the LIBOR rate published in The Wall Street Journal on the 20th of the prior month. The LIBOR rate is currently set at 5.24%. The credit tier rates range from 7.74% to 15.19%. Lower Your Already-Low Interest Rate Even More! To save you even more money, we also offer borrower benefits such as an immediate 0.25% interest rate reduction for simply enrolling in our automated debit payment program! Once you have been approved for a private student loan consolidation with Medical School Loans, you may bring a cosigner onto your loan. By having someone with a better credit history than yours sign on your loan with you, you will actually be able to lower your interest rate by up to 0.75%. Borrowers who begin the private student loan consolidation process with Medical School Loans will have an origination fee added to the principal balance on their loan. The good news is that you do not have to pay this fee upfront. The origination fee is also determined by credit standing or credit tier ranking, as well as by the highest level of education achieved by the borrower. To be eligible for a private student loan consolidation with Medical School Loans, the borrower must have at least $10,000 in eligible private student loan debt. The maximum private loan consolidation limit is $150,000. The amount that you are able to borrow or consolidate is, once again, determined by your credit standing or credit tier ranking. It is also possible to add additional private student loans to your existing Medical School Loans private consolidation loan once it has been processed. You will have a full 180 days from your funding date to include other private loans that may be new or that may have been missed when the consolidation was done. To add a loan to a private consolidation, a Master Promissory Note Addendum may be used. Upon the completion of your application to consolidate your student loans with Medical School Loans, you will directly enter your repayment period. This will usually be about twenty days from the time that funds have been disbursed to your previous lenders. To help you manage your payments, Medical School Loans offers several flexible repayment options on our private loan consolidations. This allows you to be in control of your monthly payments! You can choose which repayment option best suits your financial situation. You can choose one of our graduated, interest-only options or you can opt to make payments that include both interest and principal. And because your financial situation can change, you are free to change options as often as you like! This option also allows you to make interest-only payments for the first two years of repayment. During the third through fifth years of the loan, the payments will increase to include only a portion of the principal with the interest. Upon the sixth year, your payments will once again increase to include both the principal and interest equally throughout the remainder of the loan. Our repayment options come with extended repayment terms of up to 30 years! This is an option that is available to all of our borrowers, regardless of the balance on their loans. The combination of our extended terms and graduated repayment options can actually help you to lower your monthly payment by almost half! With a private consolidation from Medical School Loans, there are no prepayment penalties, so you can pay off your balance as early as you choose to! Any additional payments that you make on your consolidation will go directly to pay off the principal balance of your loan. Medical School Loans does offer forbearance options with our private student loan consolidations, allowing those who qualify to temporarily suspend making their monthly payments for an allotted period of time. Borrowers should bear in mind, however, that while in forbearance, interest will still continue to accrue on their consolidation. Internship, residency, deployed military, and in-school forbearances are also available to those borrowers who qualify. Another huge benefit is our incredible customer service! When you apply, you are assigned to a specific loan specialist. From the beginning of your application to the end of your loan, your loan specialist will be there to help you. You will be able to contact him or her directly by phone or email. No more waiting on hold for hours to talk to a representative, or talking to someone who knows nothing about your loan. Your personal loan specialist can answer any questions you might have pertaining to your loan, because he or she knows you and your loan. In order to consolidate your private medical student loans with Medical School Loans, you must meet the following requirements: You must be a U.S. Citizen or an eligible non-U.S. Citizen, which requires having a student visa, an F-1 form, or an I-20 form. You must also be at least 18 years of age at the time of initiating the application, have a minimum of $10,000 in U.S.-issued private student loan debt, be in the repayment period of your private student loan debt at the time the application is completed, and, finally, be credit worthy. Apply to Consolidate in Just Minutes! At Medical School Loans, we know that you have many more pressing issues to deal with than applying to consolidate your student loans. We recognize that you are a busy physician or medical student and do not have the time to fill out a lengthy application or listen to a phone representative go on for hours. That is why we made our application process quick and simple. With just a short phone call, our professional loan specialists will be able to help you complete your application to consolidate over the phone. After a quick credit check, they will be able to tell you your interest rate, your consolidation loan limit, the amount of your origination fee, and other important information that will help to save you money! In fact, the application process is so fast that in the time it takes you to read this article, you could have completed your application process! Simply call 800-680-7197 to begin your application now. After all, the days of simply caring for your teddy bear are far behind you — now you have the burden of caring for real people to bear. Let Medical School Loans help you have one less thing to worry about as you work to save lives! Medical School Loans is a leader in the medical student loan finance industry and is dedicated to helping borrowers like you realize all of their educational goals and meet all of their loan and consolidation needs. 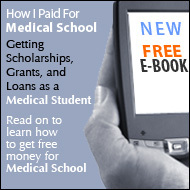 Medical School Loans' services are only available to physicians and medical students. Concentrating our efforts solely on those in this prestigious field allows us to put forth a higher standard of loan and consolidation services. We know that as a physician or medical student, you demand perfection of yourself, so why not demand perfection with the company that handles your student loans? Start Saving Money by Consolidating with Medical School Loans Today! Stop paying more on your private student loans than you have to. Trust your loans with Medical School Loans. We will handle your loans in a professional and efficient manner to help you start saving ASAP! Begin your application now to start saving! Simply click here or call 800-680-7197 to have a dedicated loan specialist help put you on the road to financial success!